It’s December, which means you can’t turn your head without seeing a pumpkin spice or eggnog something! This one is an easy one to entertain with though through the holiday season as it can be made in your slow cooker in a large batch or easily whipped up on your stove top! I’m sure you have enjoyed or have at least heard of a hot cider, but what if you’re not trying to have solely apples, but still want the cloves and citrus taste in a warm low alcoholic beverage? 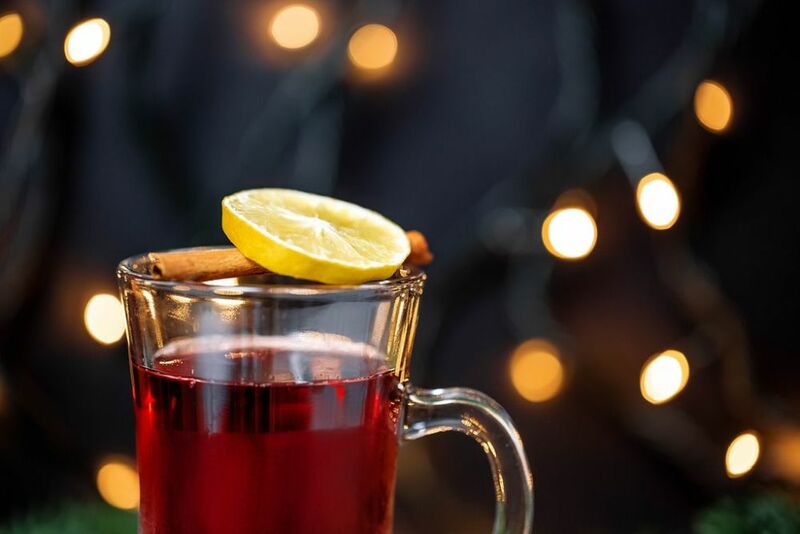 You’re going to want to try some mulled wine! It is easily going to be your next favorite holiday drink! For those of you who have not tried this, tasty dark fruit forward, stomach warming beverage, you are in for your very own holiday treat! It’s not quite a hot cider because it’s actually made with wine. Mulled wine is also known as glögg, Glühwein, hot wine or spiced wine. As some of it’s nicknames insinuate, it is a hot or warmed wine. Think along the lines of a winter sangria! It is a combination of mulling spices which include allspice, cloves, and citrus rind with usually red wine. Although there is no technical rule, that states mulled wine needs to be made with red wine, a majority are made with red wine. But feel free to use whatever grape base as you’d like as most of these have only an abv averaging around 8-13%! Notice I said your ‘next’ favorite beverage and not your ‘new’ favorite beverage. This beverage has been around for longer than our grandparents’ grandparent’s can remember! The first mulled wine dates as far back as the 2nd Century created by none other than, you (might have) guessed it; the Romans! They used to heat the wine to protect their bodies from the cold climates of winter! So perhaps it really can be considered a winter sangria, after all! As you can imagine it became to be very popular in Europe but more specifically with those the Romans traded with. Over time they started to add in spices to help increase health benefits and prevent illness! Eventually they started using flowers and citrus to help sweeten the otherwise, sometimes bitter, beverage. Glühwein is another very common name for this beverage and was more common in German speaking areas or Alsace in France. It roughly translates to “glow-wine”, from the hot irons once used for mulling. The oldest documented Glühwein can be followed all the way to Count John IV of Katzenelnbogen, a German grower who was the first to discover riesling grapes! Kind of odd because riesling tends to be a white wine! Over time the popularity of the beverage began to dwindle except for Sweden. It became even more popular there! As you can image other regions started adapting and making their own mulled wines. In parts of Sweden, they started using honey and milk to sweeten their mulled wine and this was a total game changer! So many cultures started making their own variations that finally books gave this beverage a proper name in 1609, glögg. The most valuable player in this story though, goes to the wine merchants! If it wasn’t for them we might not have brought this marvelous and odd beverage to our homes and on tables every Christmas. In the 1890’s every wine merchant had their own special recipe to sell to consumers as ‘the beverage to entertain your holiday guests!’ Today you might notice there are usually some sort of Christmas decor on the label like reindeer, a fireplace with stockings or even Santa Claus himself to help keep this tradition alive! Nowadays they make this beverage in all kinds of styles like you can get red, white, sangria blends or even vermouth blends! We have been discussing a lot about this drink being made with grape wine but did you know you can also make it with any fruit wine? Blueberry, peach, cherry, you name it! You can also add your favorite spirit into it for an extra kicker! The most common spirit being, rum! Place your mixture over heat with your blend of mulling spices to enjoy over this holiday season! Now you know all the basics about this cozy drink! Don’t be shy to reach for the hot spiced wine. You might find that you like it more than your normal go-to holiday beverage.